On the 8th September 1904, the people of Greenock and surrounding areas, enthusiastically welcomed the world-famous performer Buffalo Bill and his performing troupe of 800 men and women of all nationalities and 500 horses, for their performance of ‘Buffalo Bill’s Wild West’ at Fort Matilda. A capacity crowd of 10,000 packed the huge tent in the afternoon and almost 20,000 for the evening performance while the audiences from across the district were treated to a spectacular display of horsemanship, colourful characters and daring feats. Excitement had been building for days for the much-anticipated extravaganza headed by the popular showman, Buffalo Bill who was well-known for the enormous success of his travelling show throughout America and Europe. Earlier in the day, a convoy of three special trains, 49 carriages long and stretching for around three-quarters of a mile, arrived at Gourock station carrying the performers and all their paraphernalia. 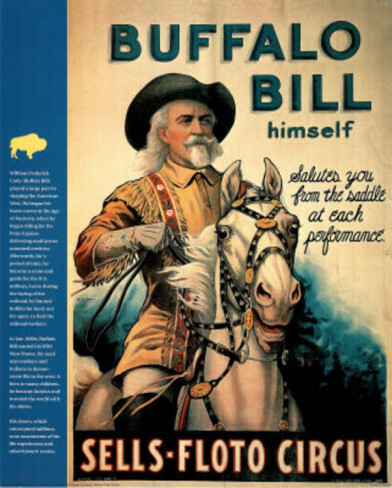 Buffalo Bill’s real name was William Fredrick Cody. He got his nickname when he was contracted to supply buffalo meat to Kansas Pacific Railroad workers. He was also employed by the United States army as a scout but is most famous around the world as a daring showman in his Wild West circus-like attractions which toured America and Europe giving his audiences an exciting taste of the American West. Queen Victoria even attended a performance when Buffalo Bill brought a show to Great Britain to celebrate her Jubilee year in 1887. In Greenock, spectators of all ages were enthralled by the variety of entertainment within the show which included a parade of horsemen of all nationalities with their colourful costumes and splendid horses, over 100 American Indians on horseback painted and whooping war-cries, displays of rifle-shooting, Mexican lasso skills and a daring bicycle leap over a 56 foot chasm. There were realistic enactments from pony express riding, as well as the hold-up of the “Deadwood Stage” and “Custer’s Last Stand”. Children in the audience particularly enjoyed the exciting fight between the cowboys and Red-skins. 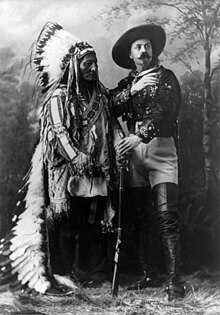 Many historical western figures performed with Buffalo Bill on some of his tours including Wild Bill Hickok, Annie Oakley and husband Frank Butler, Calamity Jane and Indian chief Sitting Bull. These instructive and entertaining displays were a credit to Bill Cody who’s shows are said to “have brought an exotic foreign world to life for its European audience allowing a glimpse at the fading American frontier.